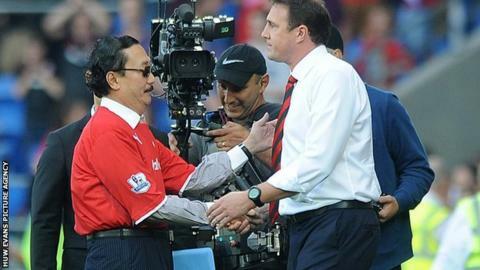 Former Cardiff City boss Malky Mackay has apologised "without reservation" to club owner Vincent Tan over the issues that led to his December 2013 sacking. The 42-year-old Scot has also halted his legal action against the club, after agreeing a settlement. Mackay said in a statement: "If I have caused any offence to anyone during this time, especially to Vincent Tan, then I apologise without reservation." Ex-Cardiff head of recruitment Iain Moody issued a similar statement. Crystal Palace sporting director Moody said: "I have today reached a final settlement agreement with Cardiff City Football Club and am very pleased that all parties will now be able to make a clean break and move on. "Wherever mistakes were made during my time at the club, I wish to apologise for any part that I played in them, and for any offence I might have caused, particularly to Tan Sri Vincent Tan and all City fans." Cardiff said the agreements were a "positive outcome" and they are now focusing on "planning for next season and the challenge of regaining Premier League status". Tan and Mackay's relationship was already strained when the club sacked Moody for an alleged overspend of £15m on transfers in the summer of 2013, something Mackay denied. Tan replaced Moody with little-known 23-year-old Alisher Apsalyamov, who had previously been on work experience at the club. Reports then emerged, before October's defeat at Chelsea, claiming Tan had tried to influence first-team tactics during matches. "The season that Cardiff fans had longed for was marred for many by the background noise. The dream became a nightmare." Mackay dismissed the story, and the Bluebirds continued to pick up the results needed to stay out of the bottom three. But, just before Christmas, it emerged Tan had sent Mackay an email telling him to resign or he would be sacked. The Malaysian businessman was not happy with a combination of results, style of play, and a perceived failure of the club's summer signings. Mackay survived the defeat at Liverpool, during which he was backed by Cardiff's travelling fans. But he was sacked after the 3-0 home defeat by Southampton on Boxing Day. The Bluebirds were 16th in the table, one point above the relegation places and four clear of bottom club Sunderland when he departed. Cardiff have since been relegated back to the Championship under Mackay's successor Ole Gunnar Solskjaer, while Mackay has been linked with jobs at Norwich, for whom he played, and West Ham United. In his statement, Mackay said he "enjoyed" his time at Cardiff and thanked Tan, the club's board and fans for their support. He acknowledged Tan had "invested heavily in the club" and that their season in the Premier League would not have been possible without him. He added: "I wish everyone associated with Cardiff City FC all the best for the future." Moody also thanked Tan personally for backing that proved "decisive" in Cardiff's promotion to the Premier League and the club's fans for their "truly special" warmth. Moody added: "My two and a half years at the club were amongst the most enjoyable and stimulating of my career and I would like to take this opportunity to thank Mr Tan and the club's board for the support they showed me during that time." Read more on Cardiff City's turbulent season: Where did it all go wrong?